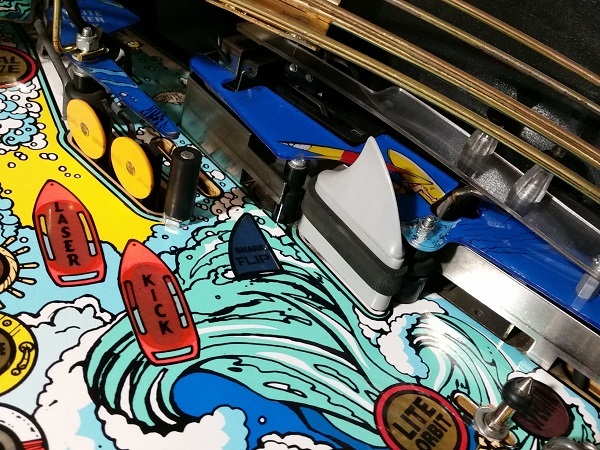 Getting everything back onto the playfield is one of my favorite parts of the pinball service as you see all the cleaning effort really come together. 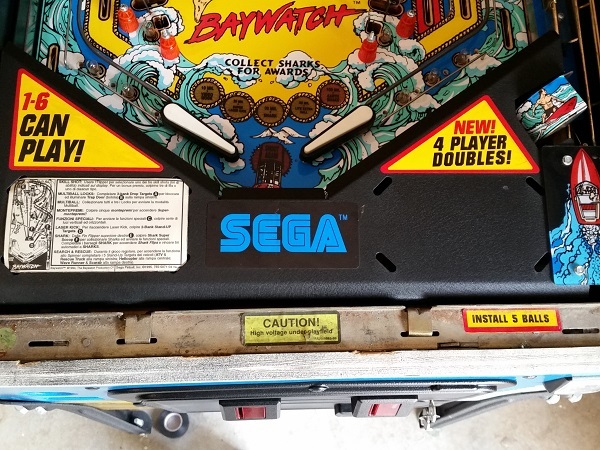 In this update, I want to get all the playfield parts cleaned up and installed back onto the machine so I can begin testing it. 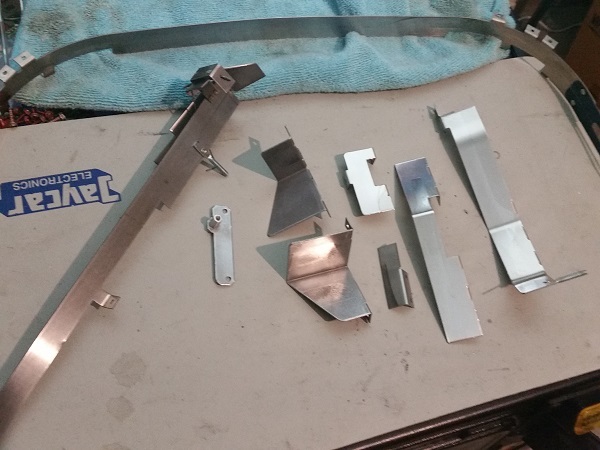 First up, several rails had been set aside for cleaning. It’s time to get into some heavy duty cleaning on Baywatch. The only way to do that, is get everything off the playfield so I have unrestricted access to the lot. People can underestimate how long this process takes, especially on DMD era machines. Pulling a playfield down can be quick, but cleaning everything and getting it all back on (in the correct layout and order) takes up more time than you expect. As always, it’s best to take a lot of photos along the way with this process. I prefer to do the playfield areas in smaller batches, but due to the number of ramps and rails, it isn’t possible here. The lower playfield area and apron have been dealt with in previous updates, so now I have the top two thirds to contend with. Although the machine is dirty, it’s going to clean up nicely. What’s better then two progress updates on a pin repair & service in the same week? Another one to go with them of course 😉 This update rounds up the final assemblies I can get at from under the playfield (besides the pop bumpers), before I move on to stripping the playfield. 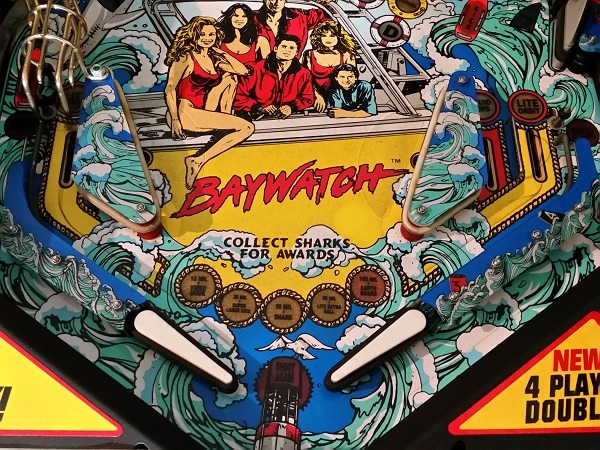 To kick this update off, I’ll start with the mini shark fin flipper on the right side of the playfield. 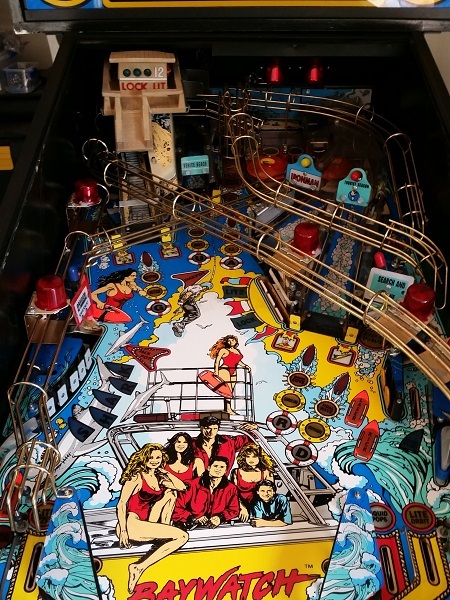 I see this and think JAWS could be a neat Pinball theme. Some fun trivia – there was an Italian conversion by Europlay of an EM pin called Jaws – with a digital display and sound card added. Linky: http://www.ipdb.org/machine.cgi?id=5080. I’m thinking something more modern would be neat in terms of JAWS. Anyway, let’s service that flipper. As mentioned in my previous update, progress has been moving pretty smoothly so far on the Baywatch overhaul. Part of the reason for this is due to working on a few things at the same time. I had been waiting on a couple of parts to arrive for the flippers in the previous update, so started work on the apron area. That way I kept making progress and it ended up being completed around the same time. It doesn’t always work out that way, but I like to keep things moving forward as much as possible so the owner isn’t without their machine for too long. As a result, you’ll see some photos in this update which contain progress from the flippers and slingshots in the previous update 🙂 Anyway – this update is solely focused on the apron area. This includes the ball trough, ball serve, shooter, up kicker and ball save assemblies. There is one problem I need to look at too, which is the ball not being served to the shooter lane correctly. Often it takes 3+ attempts to get the ball into the shooter lane. The metal apron is in excellent condition, as are the decals. A few small scratches are present on the SEGA logo, but nothing worth worrying about. The old instruction card (in Italian) will be replaced by the time I’m done. Two very minor scratches on the metal (just to the right of the SEGA decal) will be touched up with a very small amount of satin black, so you’ll never see them. I’ve been busy working away on Baywatch over the last week and a half, making some really good progress along the way with it’s overhaul. Enough progress that I’ve split the content up into three updates so you’re not bombarded with it all at once. I just haven’t had time to do all the write ups yet. But that’s OK. The priority is getting the machine done. This update will focus on the sling shots, lower flippers and cleaning of the lower playfield area. The game is in real need of a clean – which is why it’s with me. The dirty playfield stands out and you can actually spot a small circular area at the base of the right sling shot mylar patch where I have wiped away the dirt (I was interested to see how easy it came up). A nice yellow can be seen – so I think this is going to clean up great!